The I Beam disco at 1748 Haight Street, the old Masonic Temple, closed in the early 1990s, but not before the night spot made its mark in two important areas of San Francisco's cultural scene. First it was a gay club, started in the 1970s by Dr. Sanford Kellman, a retired astronomer. 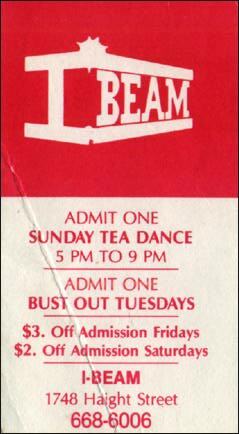 Compared with today's rave and circuit scenes, the I Beam seems like an innocent precursor. Throughout the 1980s, the club's popular Sunday Tea Dance was a favorite spot for gay guys looking for love, a quick toss, or just some good grooves on the dance floor, which was flanked by huge pillars. During that time, the I Beam was also the City's port of call for New Wave bands and Modern Rock groups, foreign and domestic. Among those who played here are Duran Duran, 10,000 Maniacs, New Order, The Cure, Red Hot Chili Peppers, Jane's Addiction, and many more. Counting Crows, in an early appearance, was discovered by record executives at the I Beam. Kellman sold the place in 1990 following the death of his lover. The I Beam operated under new management for a couple of years after Kellman sold, then closed without much fanfare. No look back at gay social history is complete without reference to the following venues: Busby's, Trocadero Transfer, Elephant Walk, Patio Cafe, the Stud, Sutter's Mill, Alta Plaza, Cafe San Marcos, the Box, Cafe Flore, Club Townsend, Pendulum, the Black Cat, Esta Noche, The Galleon, Pleasuredome, El Rio, Endup, the Eagle, Badlands, Sausage Factory, Detour, Giraffe, Kimo's, Phoenix, the Record Rack, Twin Peaks, Midnight Sun, the Mint, Josie's, "the tubs," White Swallow, and the QT, to name a smattering of gay hot spots past and present. On June 18, 2002, rumors of a one-night-only belated farewell party at the I Beam were scotched when the building that housed the former I Beam and some shops was razed to make way for new apartments. Bits of the club's sound and lighting systems could be seen hanging from sections of the partially demolished building.